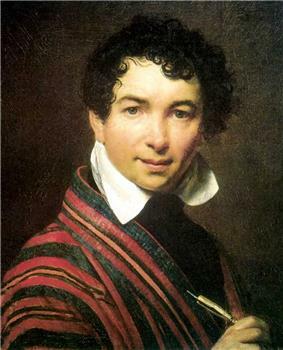 After that, Kiprensky lived in Moscow (1809), Tver 1811, Saint Petersburg 1812, in 1816–1822 he lived in Rome and Napoli. In Italy he met a local girl Anne Maria Falcucci (Mariucci), to whom he became attached. He bought her from her dissolute family and employed as his ward. On leaving Italy, he sent her to a Roman Catholic convent. In 1828, Kiprensky came back to Italy, as he got a letter from his friend Samuel Halberg, informing him that they had lost track of Mariucci. Kiprensky found Mariucci, who had been transferred to another convent. In 1836 he eventually married her. He had to convert into Roman Catholicism for this marriage to happen. He died by pneumonia in Rome later that year. He is buried in the church of Sant'Andrea delle Fratte.